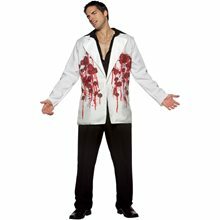 Bullet Hole Jacket Adult Costume.Includes: One White Jacket with Bullet Holes. Available Size: Mens - Standard. (One Size Fits Most Adults) Material: Polyester. *Black Shirt, Pants and Shoes Not Included. Accessories Sold Separately. Keep the change, ya filthy animal. Better watch your back, or they'll pump ya full o' lead ... again! The perfect gorey addition to any gangster or horror flick costume! Includes one solid white blazer with blood-stained bullet wound graphics. Polyester. Imported. Spot clean. Does not include shirt, pants or shoes. Smooth Criminal 2pc costume includes black pinstriped dress with zipper front, red bodice with attached suspenders and black tie.